Smoke alarms are one of the best ways to protect yourself and your family from fire and gas. Alarms are small, fairly easy to install, and can help save your life in the event of an emergency. However, it’s important to install and maintain them correctly. Otherwise, they may not work as well as they should. Here are some tips regarding the installation of smoke alarms and carbon monoxide (CO) alarms in your home. The first step for the installation of smoke alarms is to make sure you have the right alarms. There are two different kinds you need to have. One is a smoke alarm to detect fire and the other is a CO alarm. Carbon monoxide is an odorless, colorless gas. You can’t see it. If it builds up in the home, it can cause dangerous side effects. But, even though you won’t know it’s there, the CO alarm will. According to the National Fire Protection Association (NFPA), your alarms should have the label of a recognized testing laboratory. You can also find alarms designed specifically for certain rooms, like the bedroom or kitchen. But, any standard alarm will work just fine. 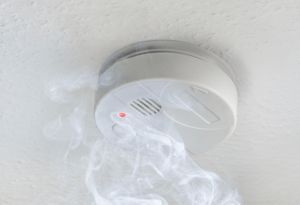 Most homes need more than one smoke alarm. But, check with your local codes to be sure. As a general rule of thumb, every level and bedroom should have one. In the event that a fire starts while you are asleep, a smoke alarm can wake you up. The NFPA also recommends you put a smoke alarm in the living room and at the bottom of the basement stairs. It’s also a good idea to put one in long hallways. If you put one in the kitchen, make sure it’s at least 10 feet away from the oven and other cooking appliances. If it’s too close, simply boiling pasta or making toast can set off the alarm. Now that you’ve got the alarm and know where to put it, it’s time to install it. Take the mounting base and screw it into the ceiling. Use a pencil to mark the holes. Also, a drill, drill bits, and a ladder can help make the installation easier. After that, all you have to do is twist the alarm into place on the base. Make sure the batteries are in before you do so. Most batteries will last up to 10 years. But, you’ll want to test the alarms once a month. If the alarm starts chirping, it means the battery is getting low. The NFPA also recommends that you don’t paint over the alarms. Additionally, do not cover them with stickers or decorations either. It’s important to prepare your home for an emergency. Pick up all the supplies you need for the installation of smoke alarms at Cape Ace Hardware. Find us in the Cape St. Claire Plaza.